Recent detection of gravitational waves (GW) by LIGO has provided a direct and firm test of the validity of Einstein's theory of general relativity. GWs detected in August 2017 were produced by the collision of two neutron stars about 130 million light years from the Earth. Neutron stars had a diameter of about 20 km but were 1.17 and 1.60 times more massive than our Sun. Some of the mass is converted into energy as the neutron stars spiralled to merger. This energy was radiated in the form of particles, electromagnetic (EM) and GW waves. EM waves were detected by a number of observatories and GW were detected by the LIGO laboratories. Indirect evidence of the validity of the General Theory had been accumulating over the past 100 years starting in 1919 when Eddington observed the bending of light from a distant star passing near the Sun. The light was found to bend by the amount predicted by Einstein. The strongest evidence was obtained through the observation on binary pulsars - two neutron stars rotating around each other. 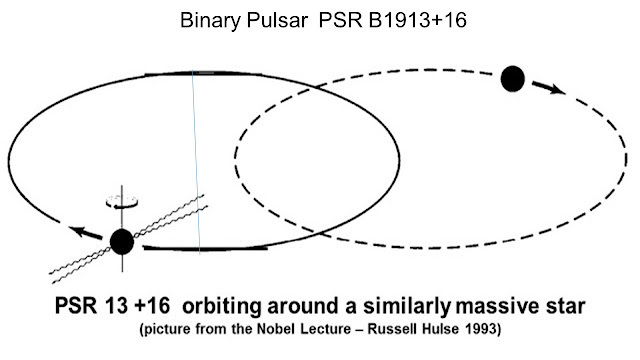 The first binary pulsar system, PSR B1913+16, was detected by Joseph Taylor and Russell Hulse in 1974. They were awarded the 1993 Nobel Prize for finding the pulsar system. The two neutron stars in the binary pulsar are 1.438 and 1,390 times the mass of our Sun. The binary pulsar PSR B1913+16 is 21000 light years from the Earth. The elliptical orbit has an eccentricity equal to 0.617 and a semi-major axis equal to 1.95 million km. The neutron stars complete a rotation in 7 hours and 45 minutes. The rotation distorts spacetime in the vicinity and energy is radiated out as gravitational waves. Einstein's theory predicts the exact amount of GW radiation that would be emitted. The radiated energy is lost from the rotational energy of the binary pulsar system and neutron stars get progressively closer. The observed change in orbit parameters (the semi-major axis is decreasing by 3.5 meters per year) provides the point of comparison with the prediction of the General Theory. It is estimated that it will take about 300 million years before the neutron stars merge. 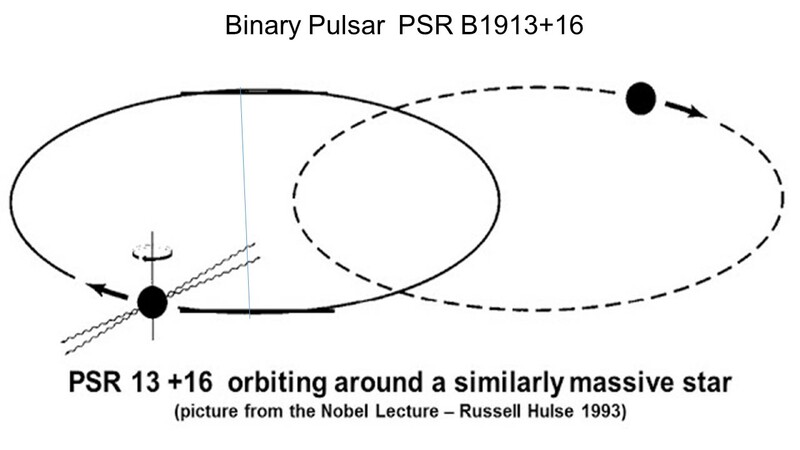 Several other binary pulsars have been studied since the discovery of PSR B1913+16. Observations from these also confirm the validity of the General Theory of Relativity, albeit with somewhat lower accuracy. I am indebted to Professor Joseph Taylor for permission to use the orbital decay figure.